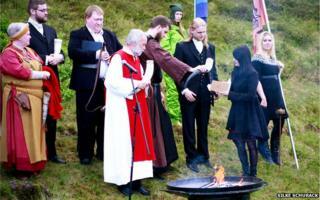 It has been the dream of Iceland´s neo-pagan worshippers for four decades. Now construction of the first heathen temple or "hof" to be built in a Nordic country in almost 1,000 years is set to get under way. Work will start in March on a wooded hill near to the the capital Reykjavik's domestic airport. The temple will provide followers of Iceland's old Norse religion with a place to hold their communal "blot" - or feasts - as well as marriages, name-giving ceremonies, funerals and rite of passage ceremonies for teenagers. Until now, ceremonies have mostly been conducted outdoors during the summer. "At last, our long journey across the desert is at an end," says Hilmar Orn Hilmarsson, a composer and high priest of Iceland's neo-pagan Asatru movement. Designed by Danish-educated architect and Asatru member Magnus Jensen, the oval-shaped temple will be built into the side of the hill and use the natural rock as one of the walls. The nearby airport was built by occupying British forces in 1940, and the surrounding landscape is dotted with deserted gun positions and a cemetery with the remains of British servicemen. Water will flow down the stone wall and collect in pools on the floor. Local wood will be used, and a skylight in the temple's dome will allow for an ever-changing interplay of light and shadow on a daily and seasonal basis. It will incorporate the ancient concept of the "golden ratio", a geometric proportion regarded as the most aesthetically pleasing to the human eye. With the design, Mr Jensen says he is seeking to combine natural with manmade, and indoors with outdoors. For him, the building should appear timeless. He does not want it to resemble a traditional Viking temple or remain specifically modern in style. Norse paganism was the common belief in Iceland until 1000 AD, when its lawmakers conceded to Christian demands that Christianity should become the country's official religion. Loki - mischievous "trickster god"
This compromise saved the nation from a bloody civil war. All that pagans asked was to be allowed to practise their religion privately. But once Christianity had established itself, paganism was suppressed and forced underground. However, thanks to the literary endeavours of 13th Century Icelandic scholar and chieftain Snorri Sturlason, the old Norse myths were preserved and widely read by Icelanders through the ages. Sturlason's epic text Prose Edda and the family sagas ensured Iceland´s pagan heritage was kept very much alive in the national consciousness. And in spring 1972 a few individuals came together in a cafe in Reykjavik to bring it back to life by establishing the Asatru association. Later that year, the group's elected high priest, Sveinbjorn Beinteinsson, met Iceland's minister of justice and ecclesiastical affairs to present a request for the Norse religion to be recognised as an official religion in Iceland. The move was met with opposition, with Iceland's Lutheran bishop saying a constitutional ruling on religious freedoms should not apply to polytheistic religions. But the story goes that shortly after Mr Beinteinsson left the justice ministry, a powerful thunderstorm started up, causing a power cut in the capital. Some Icelanders like to think it was Thor, the god of thunder, having his say on the matter, as a few months later the minister agreed formally to recognise the Asatru. Today the Asatru has close to 3,000 members and is one of the fastest growing religions in Iceland. Its principles are non-authoritarian and decentralised, with no sacred text or official founder. Its philosophy promotes tolerance and individual liberty. It costs nothing to join and is open to all irrespective of race, cultural background, gender or sexuality. It does not aim to convert people and followers of any religion are welcome to their public feasts, or "blot"
Followers do not pray in the traditional sense and do not necessary believe in gods but instead, as Hilmar Hilmarsson explains, see the Norse myths as "wonderfully layered stories rich in symbolism and metaphors". Because of the focus on living in harmony with nature, the temple's builders will carefully dig up the trees on the construction site and replant them elsewhere. The "hof" should be completed late next year and Mr Hilmarsson is confident it will attract considerable attention among visitors. "Foreigners are more than welcome to join our feasts, get married here or have a name-giving ceremony and we can arrange all the formalities," he says. "People have come away from our ceremonies with a changed outlook, moved in a way they had never expected."